This week our Master Key Mastermind group was not only encouraged but required to identify at least 2 acts of kindness per day and note them in our alliances portal. How wonderfully joy-filled such as assignment was not only based on what we personally participated in or observed but also from reading the many posts by others in our alliance. I think it should simply become a part of our ongoing lifestyle. I admit at first it took a minute to focus in on what to do or notice what others did that fit the criteria. After the first couple of days it became a much more fluid effort. K – Keep expecting to see acts of kindness everywhere you look. I – Inspire people as often as you can. Proactively encourage someone at home, work…or even a stranger. N – Notice what other people do for others and let them know you noticed. That will boost their joy in giving. D – Decide each morning to express kindness to at least one person. Actually put it in your schedule. N.E.S.S – …and Never Ever Stop Sharing! Go ahead and get started now. 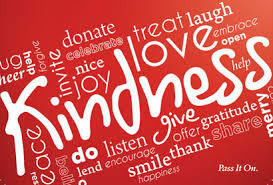 What act of kindness could you do in the next five minutes? Remember it doesn’t have to be a large gesture at all…small words of acknowledgement and love work wonders. Take some action on it right now. If you do, you’ll be glad you did (and so will they). Be kind! Celeste, I love the way you defined K.I.N.D.N.E.S.S.! Beautiful! Thank you for sharing!